American Elements manufactures a diverse portfolio of advanced materials for all types of industrial coating applications and technologies including chemical and physical vapor deposition (CVD/PVD), spin coating, thermal spraying, and vacuum metallization. Customers in industries ranging from automotive, aerospace, defense, semiconductor and microelectronics, metallurgy, oil and gas, and medical instrumentation rely on American Elements to provide the highest quality products for their specific needs. Industrial pigments are inorganic compounds or metals that fall under three broad classifications based on their primary functions. Appearance-improving pigments bestow surfaces with particular colors or visual effects such as metallic sparkle or luster. Functional pigments are used primarily to improve the physical and/or chemical properties of the coating. 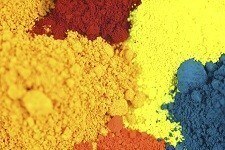 Filler pigments (or extender pigments) are materials that can serve as lower-cost substitutions for functional pigments. White pigments create optical effects by non-selective light scattering, and include titanium dioxide, zinc sulfide, lithopone, zinc white. Colored pigments create an optical effect by selective light absorption and scattering, as in iron oxide red and yellow, cadmium pigments, ultramarine pigments, and cobalt blue. Black pigments create optical effects through non-selective light absorption, as with carbon black pigment and iron oxide black. Effect pigments create optical effects such as luster, “color flop effects”, or sparkling based on reflection, refraction, and interference. Luminescent pigments absorb radiation and re-emit light of a longer wavelength. Functional pigments improve a coating's physical and chemical properties. Zinc ferrite pigments give coatings heat stability and corrosion resistance; aluminum hydroxide (also known as aluminum trihydrate) provides a coating with flame resistance. Filler pigments or extender pigments are used primarily to reduce costs while also enhancing coating performance. Filler pigments are often substituted for more expensive functional color pigments. Calcium carbonate is one example. Mixed metal oxide (MMO) pigments, also known as complex inorganic color pigments (CICPs), provide coatings with excellent temperature, corrosion and UV resistance due to their chemical inertness and infrared reflective (IRR) properties. MMO pigments are usually highly inert chemical compounds, and are therefore considered non-toxic and can be used in toys and in materials which come into contact with food. Structural and architectural coatings that contain these types of pigments stay cooler in sunlight as they exhibit substantially higher levels of total solar reflectivity (TSR) than purely organic corollaries, whose high absorptivity can leads to higher interior temperatures and higher costs associated with cooling. Cobalt and chromium-based MMO pigments also make for excellent non-detectable camouflage coatings due to their inability to absorb infrared heat. Several types of coatings impart particular properties to optical components such as windows, lenses, mirrors, and other glasses. Metallic and dielectric optical coatings include high reflection, anti-reflection (AR), ultraviolet (UV), infrared (IR), protective (anti-scratch, anti-wear, etc), polarizing, filtering, and more. Optical coatings of metallic or dielectric layers in semiconductor devices can increase light transmittance of light, selectively reflect colors and harden surfaces to prevent scratches. Typical coating methods include electron beam (e-beam) evaporation, ion-assisted deposition, and ion beam sputtering (IBS), which yields the highest quality and durable coatings. Techniques include electroplating, anodizing, powder coating, plasma electrolytic oxidation (PEO), and phosphate conversion are used to produce coatings in metallurgical applications. Most industrial and specialty-purpose coatings are primarily organic, based on compounds such as alkyds, urethanes, epoxies and acrylics. Inorganic materials can be play a role at any stage of the coating process. They can serve as surface pretreatments, components of primers, curing or dying agents, or may be added to the coating itself as degassing agents, abrasives, pigments, or fillers. Adding abrasive compounds to coating mixtures in the form of powders, grit, or granules enhances the durability of metallic surfaces by providing protection from rust, wear, and further abrasion. Examples of abrasives used in this way include silicon carbide and aluminum oxide (white-fused and brown-fused). Medical instruments and devices derive a number of benefits from thin-film coatings of biocompatible materials, which may be either biologically inert or bioactive, depending on the intended function. Many such coatings are organic polymers that are stable in the body, but some inorganic materials also play important roles. Many oxide, silica, or carbon-based ceramics are stable in the body, and coatings of such materials may be used to protect the underlying metal surface of an implanted medical device. Bioactive ceramics, such as those containing hydroxyapatite, a primary component of bone, can be used to promote bone growth and osseointegration of implants. Bioglasses, which contain varying proportions of silica, sodium oxide, calcium oxide, and phosphorous pentoxide depending on their precise intended function, also influence bone growth, and can be applied alone as coatings or included in polymer-glass composite coatings on metallic implants. An additional important coating material for implants is pyrolytic carbon, which notably prevents blood clots from forming at the implant surface. For this reason, it is frequently used to coat artificial heart valve components. A number of nitride materials, such as titanium nitride and zirconium nitride, are used in medical devices due to their exceptionally high biostability. They are especially important as electrodes in bioelectronics, as few other electrode materials can withstand the corrosive conditions within the body. In addition to being body-safe, these materials are also extremely hard and can hold a sharp edge, so they are also used as coatings on cutting tools in medical settings. A final type of coating relevant to medicine is antibiotic coatings. Metals that naturally exhibit antimicrobial effects, primarily silver, copper, and their alloys, may be used in surface treatments in a variety of ways to reduce risk of contamination of an object that must remain sterile. Often, nanoparticles of antimicrobial metals are embedded in another type of coating. Additionally, surfaces may be plated with brass alloys that exhibit antimicrobial activity. Thermal barrier coatings are actually layered systems of coatings used to allow metal parts to withstand extreme operating conditions, particularly high temperatures such as those found in combustion engines. Typically, these coatings consist of a metallic bond coat, followed by a thermally grown oxide and finally a ceramic topcoat. The topcoat is typically a stabilized zirconia ceramic. These coatings are used widely on automotive engine parts, largely in the exhaust system, and on components of gas turbines and jet engines. Surface coating technologies are utilized in the manufacturing of a wide range of consumer products from automobiles to advanced microelectronics. Coatings impart new properties to a material without altering its internal chemistry: protective layers that provide corrosion and wear resistant surface passivation to industrial parts, fire-retardant layers for consumer products, thin films that give antireflective or UV-blocking characteristics to optical components; antimicrobial surfaces that protect medical instruments; decorative surface treatments for finished products. Coatings can also utilize pigments to provide particular colors, for example, to ceramic glazes, optical lenses, paints, and solid film lubricants. Deposition of thin films is a critical technology for the manufacturing of semiconductor and optoelectronic devices, photovoltaic cells, light-emitting diodes (LED) and other high technology applications. Thin films can range in size from several microns to fractions of a nanometer and can be deposited on a substrate by several different methods which fall under the broad categories of physical and chemical processes. Some examples include chemical vapor deposition (CVD) and metal-organic chemical vapor deposition (MOCVD), molecular beam epitaxy, atomic layer deposition (ALD), spin coating or sol-gel processes, pulsed laser deposition (PLD), electrospray, cathodic arc deposition (arc-PVD), and sputtering. Thin films can serve as permeation barrier coatings, high-K and low-K dielectric coatings, or provide magnetic shielding, insulation or conduction, and resistance to heat, wear, and friction. Thermal spraying techniques produce coatings ranging from 20 microns to several millimeters using powders, or in some cases wires, of metals, alloys, oxides, carbides, cermets, and ceramic materials. Many thermal spray coatings are notably effective for providing resistance to wear and erosion, chemical reactions, and high temperatures. Certain types of thermal spray coatings possess special properties such as electrical conductivity, electrical insulation (dielectric coatings), biocompatibility, oxygen sensing, electromagnetic interference (EMI) and radio frequency interference (RFI) shielding, and porosity (employed in solid oxide fuel cell interconnects). Thermal spraying is also one method of producing thermal barrier coatings (TBCs), which help protect the metallic substrates of gas turbine engines, aircraft, and semiconductor components from heat and thermal degradation. TBCs typically consist of multiple layers that include, along with the metallic or superalloy substrate, a bond coat (nano-structured ceramic-metallic composite to promote adhesion with the substrate), a ceramic topcoat (the most common of which is yttria-stabilized zirconia (YSZ), though other materials such as perovskites, aluminates, and rare earth zirconates are under investigation), and a thermally-grown oxide (TGO) that forms when the bond layer is exposed to heat and prevents the substrate from being oxidized. American Element manufactures a range of thermal spray coating materials including pure metals, alloys, oxides and mixed-metal oxides, and ceramics in powder or wires forms. Powders can be produced via several different techniques including fusing, sintering, agglomerating, blending, or gas and water atomization; we can manufacture nanoscale powders with precise morphologies, particle dispersions, and chemistries appropriate for individual applications or specific processes such as HVAF. American Elements manufactures a comprehensive array of materials for use in pigments and coatings applications. These include thin film deposition precursors such as organometallics as well as metals, alloys, oxides, other compounds in a variety of forms including nanopowders. Our ability to precisely control the chemistry and microstructure of our materials gives us the ability to produce materials precisely to customer specifications, allowing our customers to fine-tune the characteristics of their coatings for optimal results. Our engineers can technical guidance in the selection of appropriate materials for specific applications.